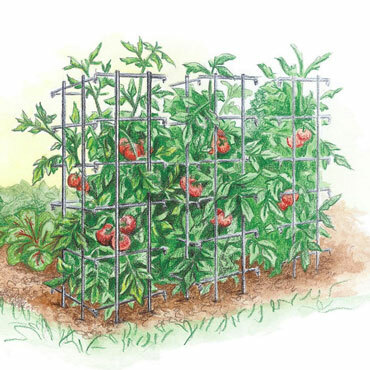 Tomatoes often need stakes or other supports to keep the fruit healthy and off the ground. Now, instead of having to painstakingly build your own, you can use our convenient Tomato Cage. Each pack comes with two cages made of heavy-gauge wire sturdy enough to support plants loaded with fruit. The square design featuring eight legs allows the cages to be stacked in order to accommodate even the most vigorous climbers, or secured into the dirt side-by-side for your tamer tomatoes. They provide a generous growing area of over 3.5 cubic ft. Each package includes 2-48" cages.